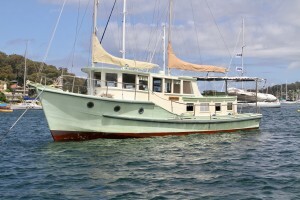 Joy Sea has been in the same family for almost two decades. 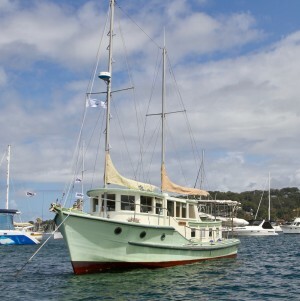 Initially built by the Bundaberg Boat Shed as a Prawn trawler, she was later converted to a pleasure cruiser after a long career trawling the coast and river mouths of north Queensland. 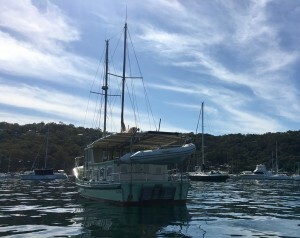 Joy Sea is a proper sea-going vessel, strong and well balanced, with the advantage of her stabilizing sails to stop her rolling. 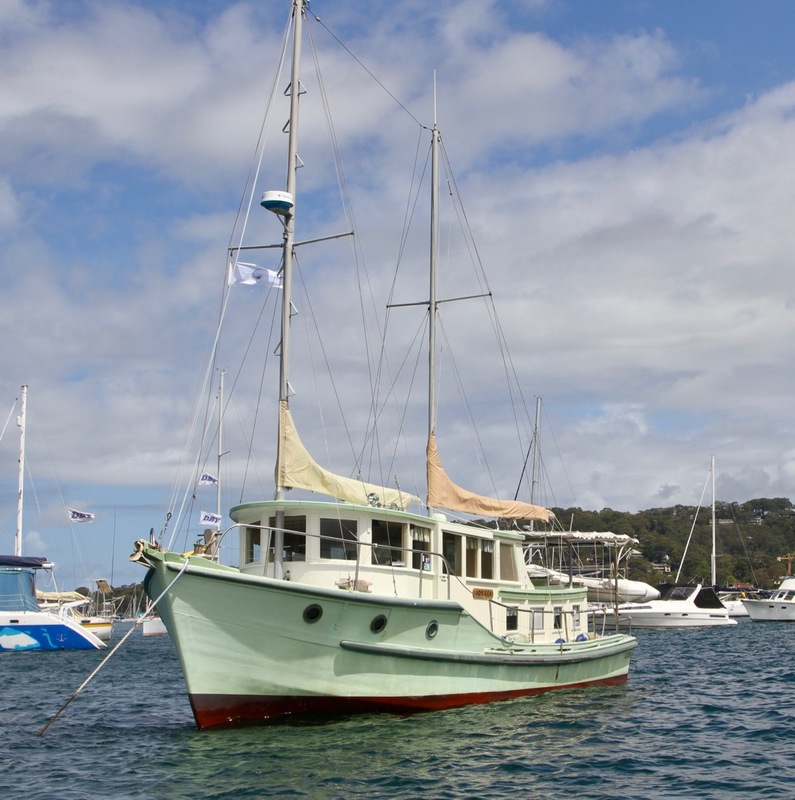 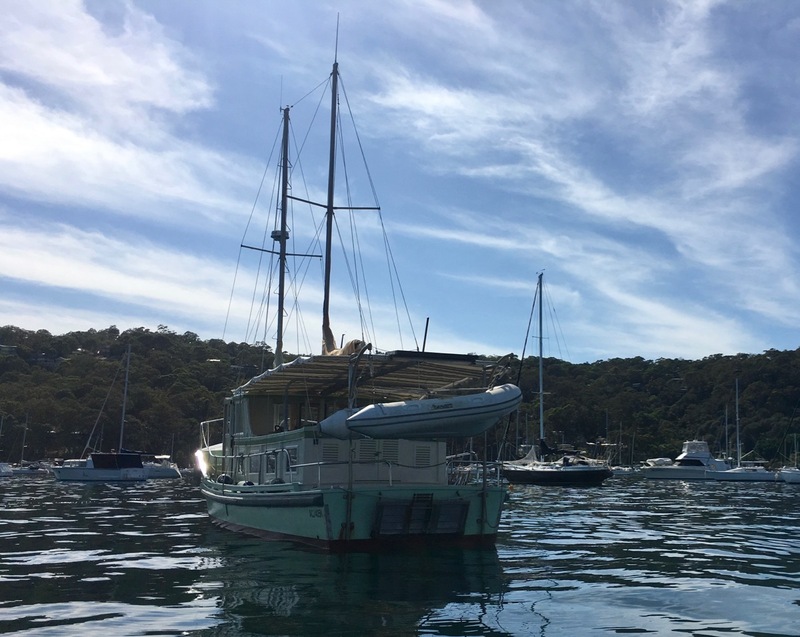 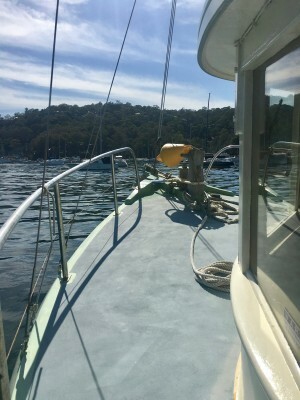 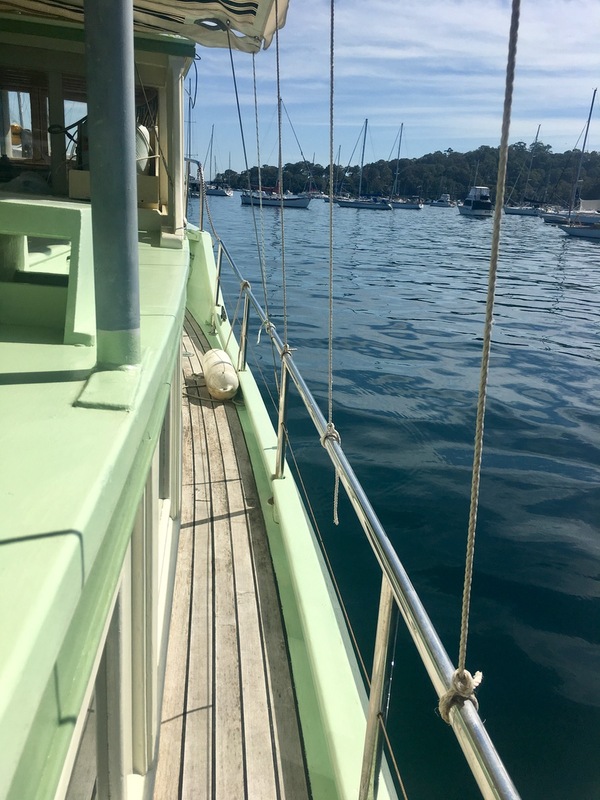 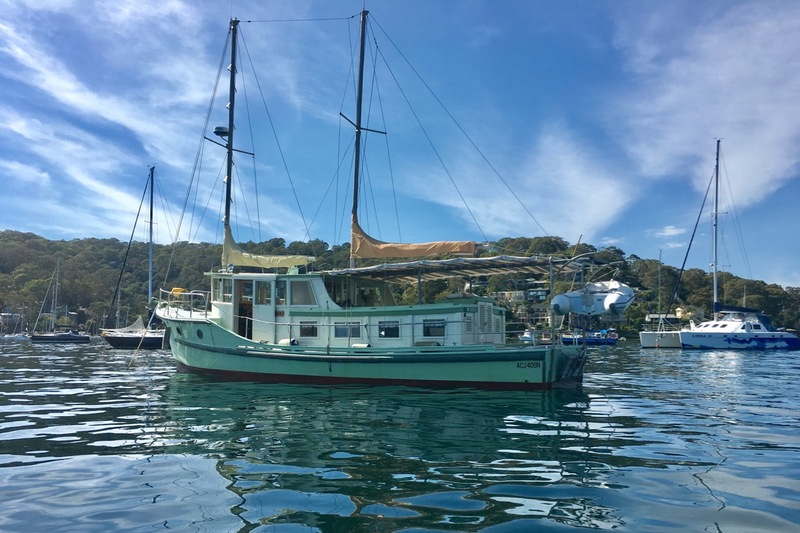 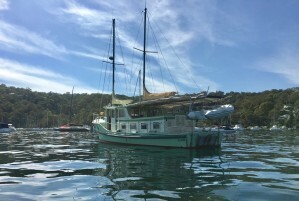 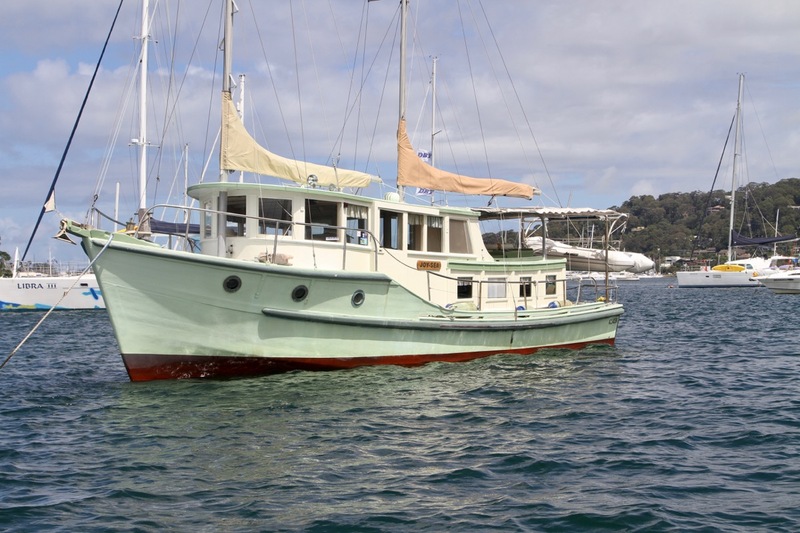 Her owners sailed her down the coast of Queensland and NSW, and described their trip as idyllic. Her incredibly hard hull is designed with a hard shine construction of hardwood planks and transverse frames and stringers, fastened by copper clenched nails and with a keel of hardwood. In 2011, her owners, on the advice of a reputable surveyor friend, dried and shaved the entire hull before sheathing the hull with epoxy and GRP. 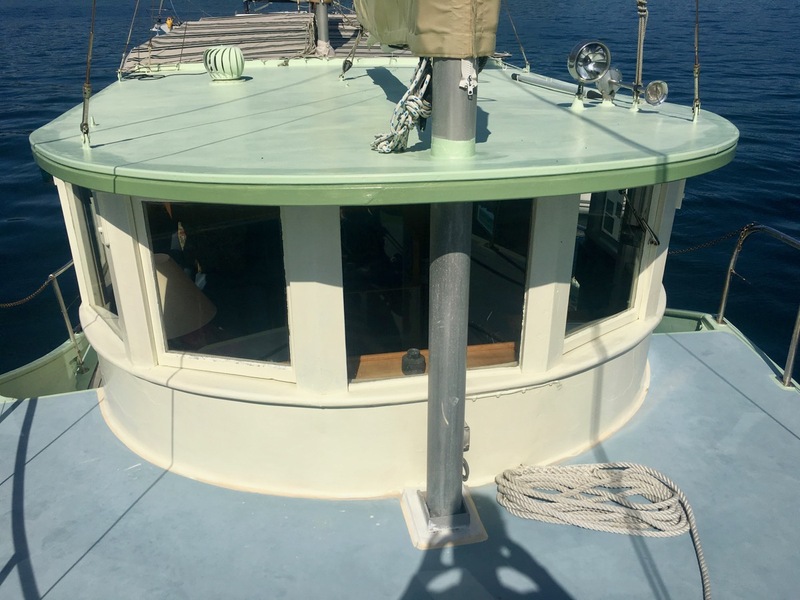 This tightened the ship, gave her a smooth finish, and eliminated the needs for caulking, as all timber boats need every now and then. The hull was then painted with durable Seagloss 505. The hull presents immaculately, and after 6 years it is evident that the sheathing work was remarkably done, without delimitation or movement. 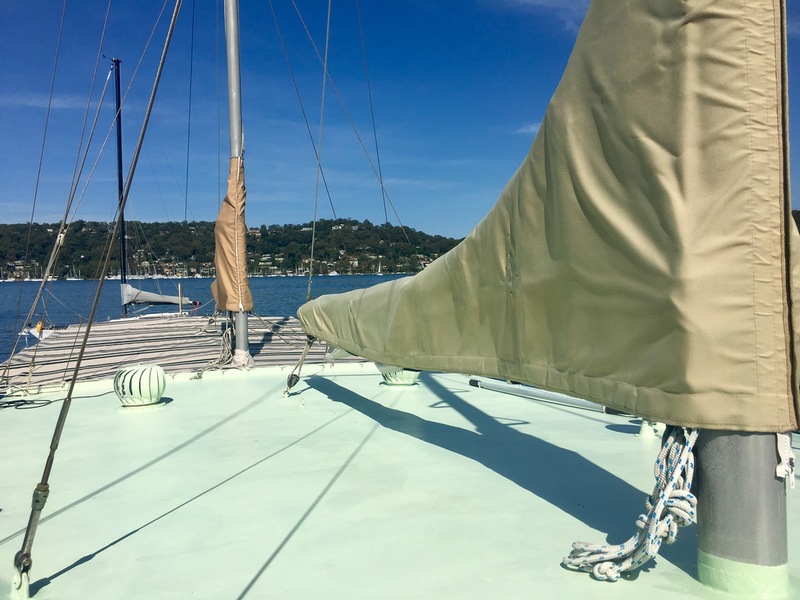 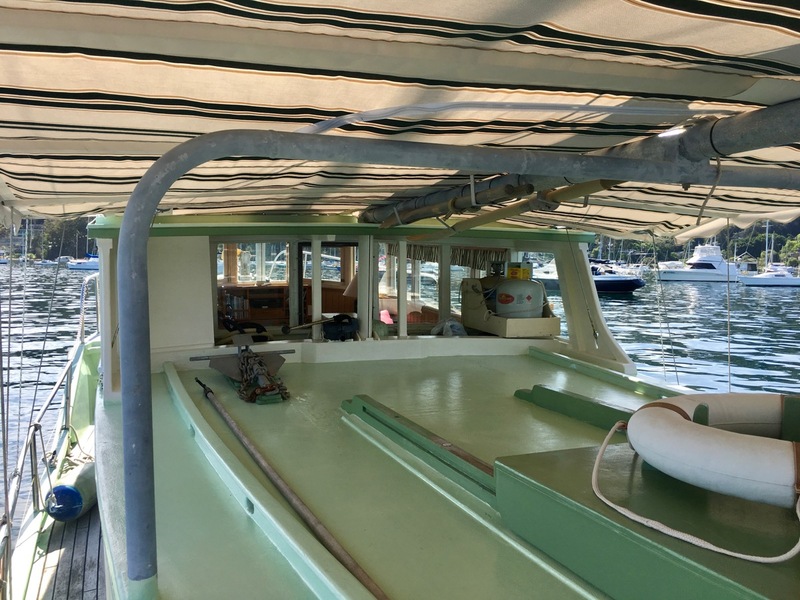 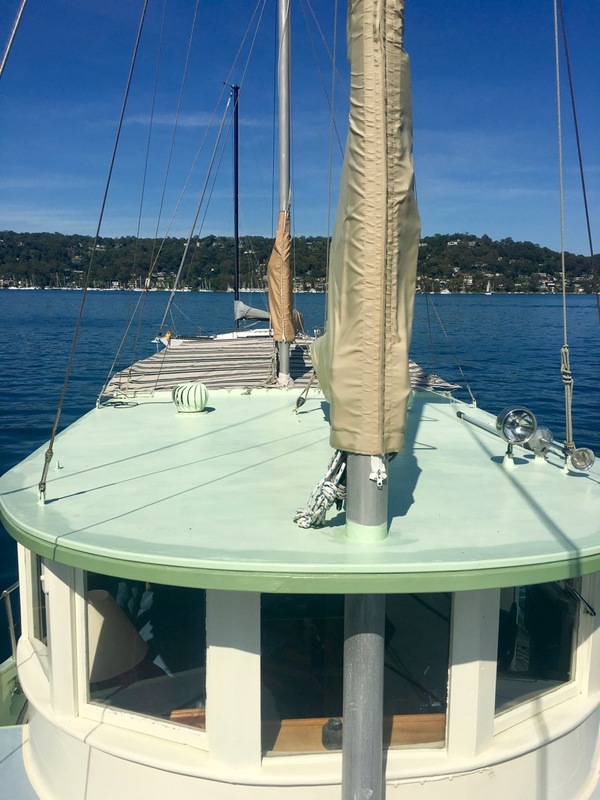 Joy Sea's foredeck is in perfect condition, with no damage or softness anywhere. The deck is Dynel sheathed and painted over a high build primer to ensure durability and a minimum of maintenance needed. 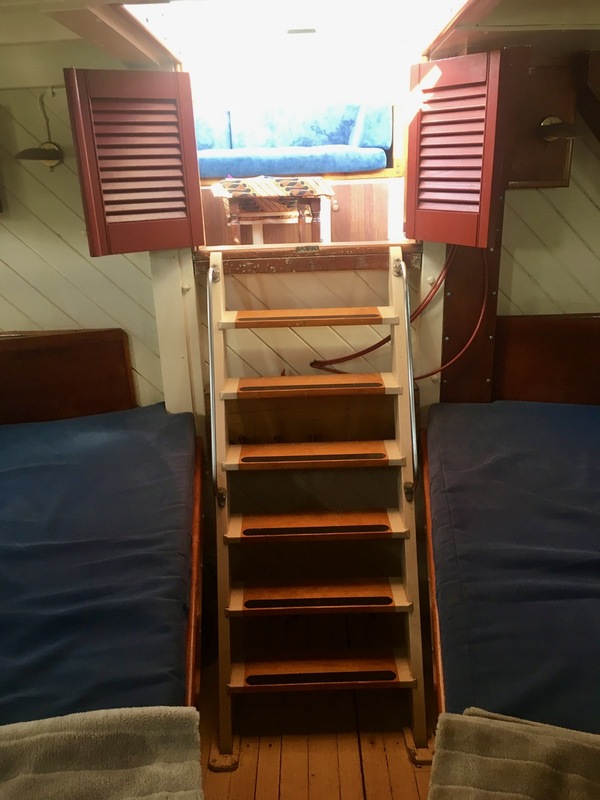 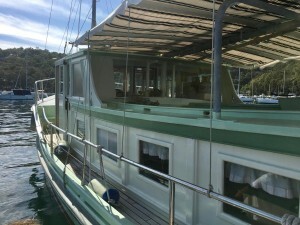 Perhaps one of her most charming attribute, is the laid beech side decks and cockpit, with a tight caulking in perfect condition. 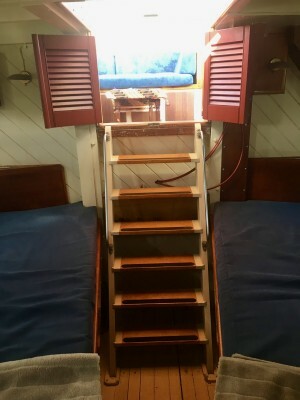 Unlike teak, beech if far more expensive to purchase, and virtually impossible to factor in modern ship building due to the cost, is a lot more durable, will not get 'gummy' or grooved, as teak does, and gives a light colored, highly valued new-modern look to a classic cruiser. 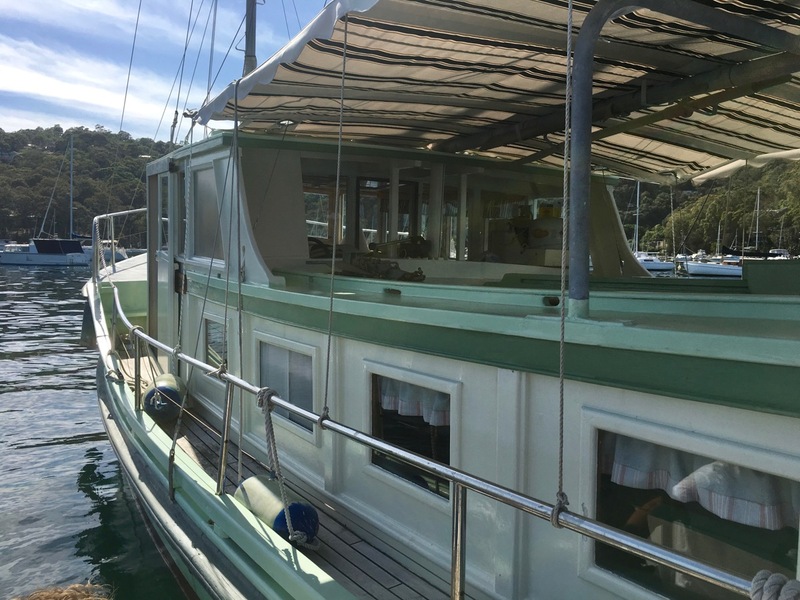 Perfect as a live-aboard or as a perfect get-away boat for even a large family, this truly beautiful boat has the strong shoulders to keep everyone safe, yet the charm to turn every head wherever you go. 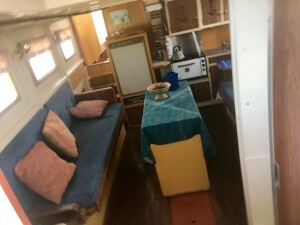 Her back cockpit and entire coachroof is protected by a new sun awning, which is sturdy enough not to have to be put away during a gale, and is high enough to allow you to move easily along the decks. 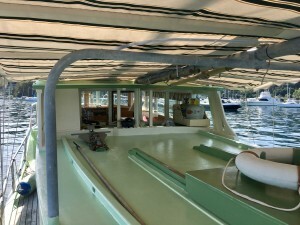 It helps cool the boat down in the summer, and provides valuable cover to those wishing to use the coachroof to relax during the day or spend a night in a cooler place. 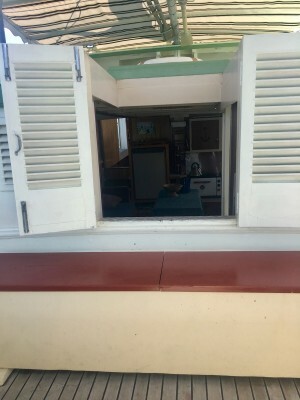 This was a favorite spot of the owner's children, and later grandchildren when holidaying. Walking around the decks, or accessing the foredeck is easy. 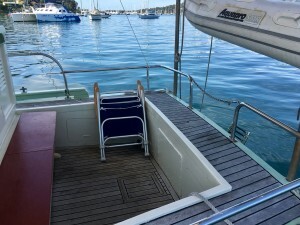 The safe, high bulwarks and wide sides are designed to make movement safe and comfortable in all weather. 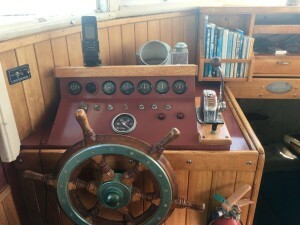 The interior is accessed by two ways, either from the back cockpit, or though the sliding door adjacent the helm. 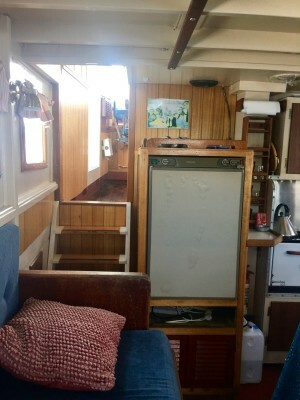 Aft, down a few sturdy non-slip steps is the galley and saloon, which spreads the whole width of the boat, and from midship to the aft cockpit. 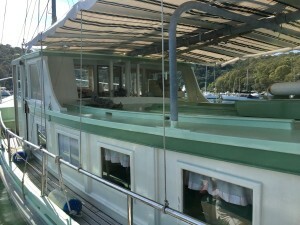 It has very good headroom and is designed as the first indoor are of the boat. 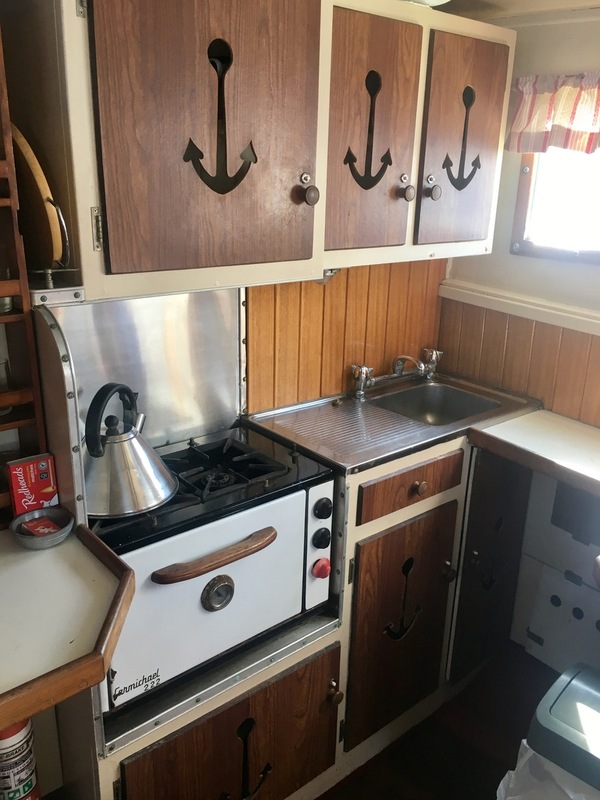 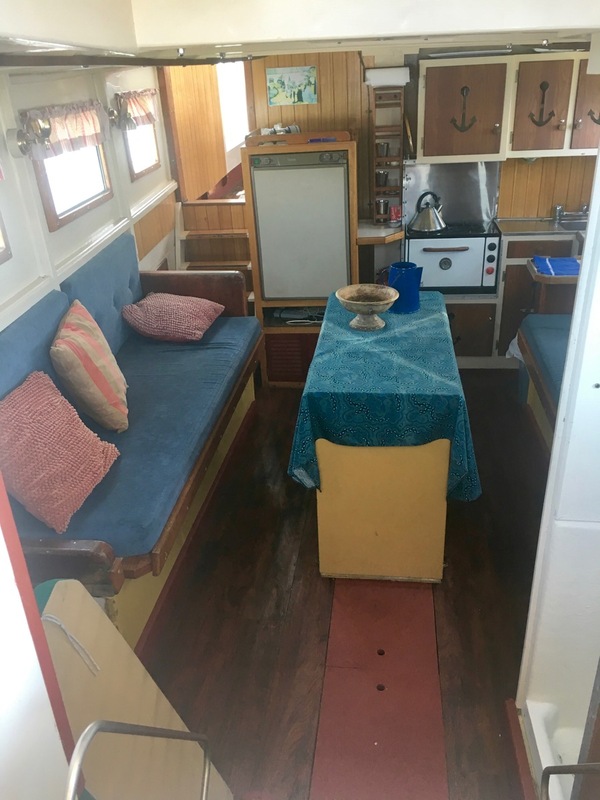 The galley is well equipped, with a large fridge, sink with hot and cold water (pressurized), a fantastic, well designed stove with oven, and ample storage. The butterfly saloon table is fringed by two settees that can be used as comfortable single bunks when the night comes. 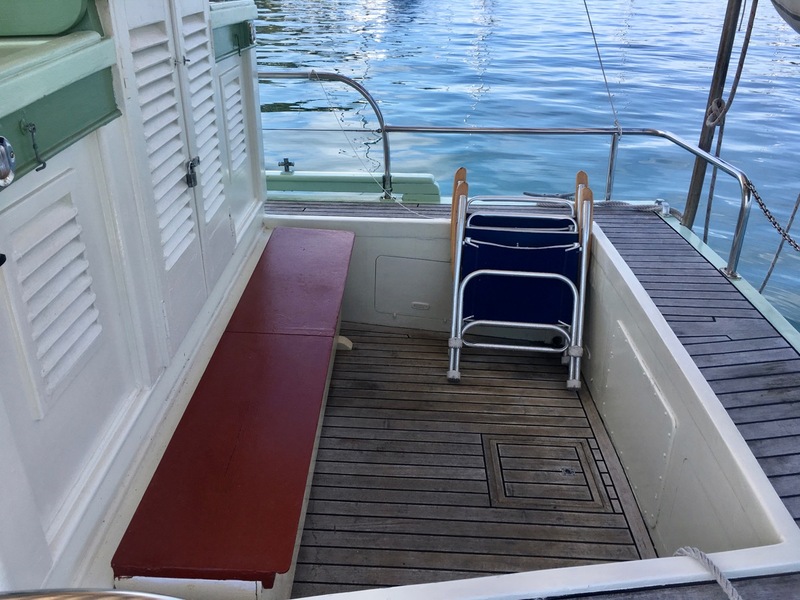 The table and saloon can accommodate 8-10, and with the collapsible table sides, there is no obstruction or waste of moving space. 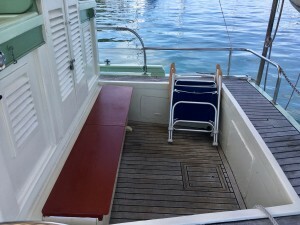 the table can be extended on one side and not the other when accommodating a smaller crowd. 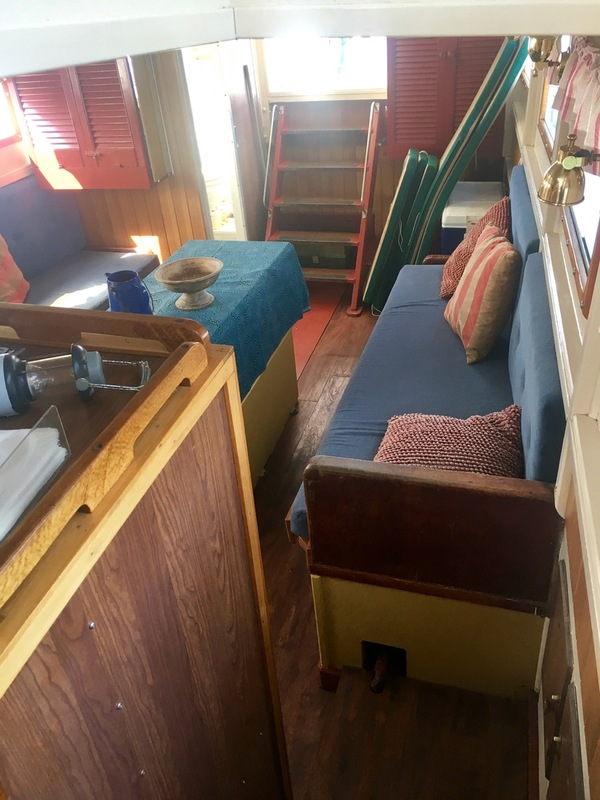 The forward center of the table still houses the original cool box, or larder. 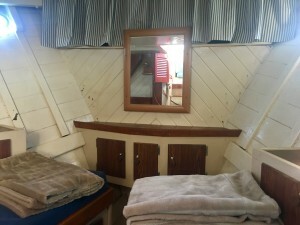 Aft on the starboard side is the head and shower area, which is of good proportion and enclosed. 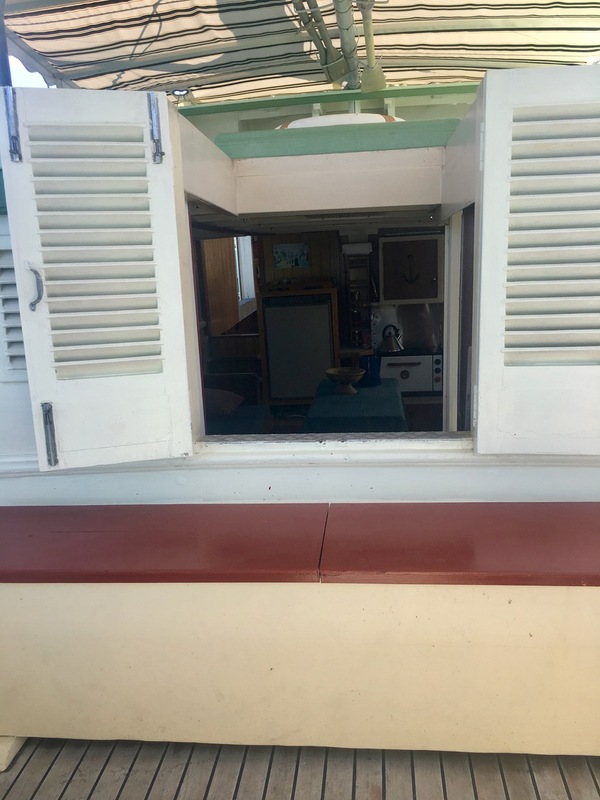 The paint used is designed to be water resistant, so you do not have to worry about drying everything or having a shower curtain. 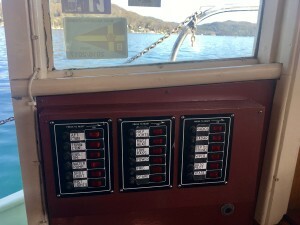 The boat is equipped with hot and cold water, and the shower is pressurised, with electric drain going overboard. The toilet is electric. 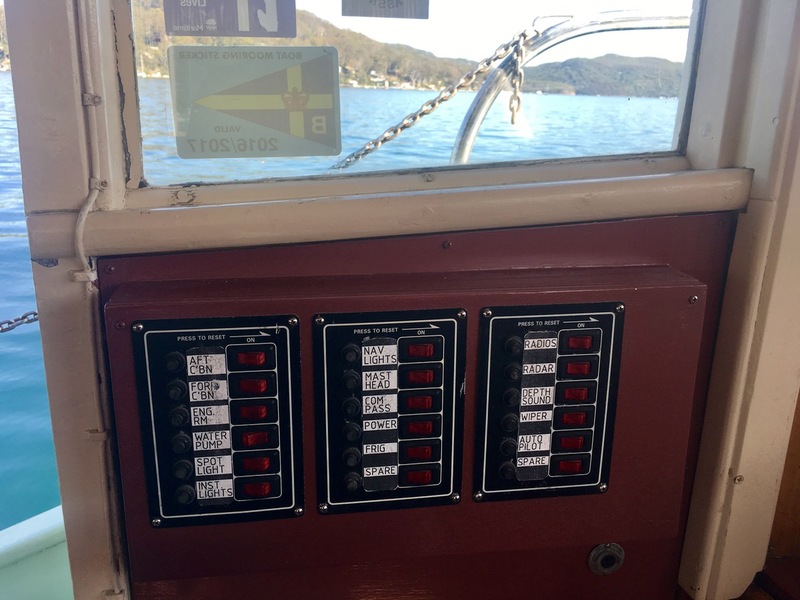 Everywhere on the boat light and fresh air is in abundance. 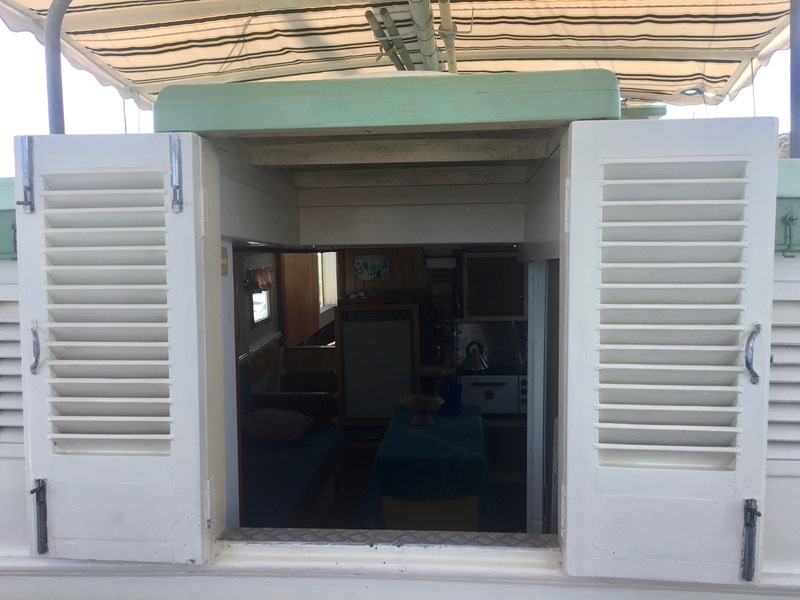 The forward cabin is more sheltered, although there is good ventilation, very high headroom and two comfortable single bunks. 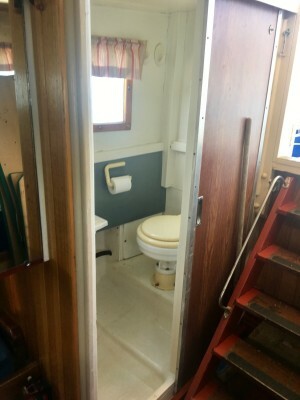 Fresh and dry, this cabin is reserved for the masters of the ship.It also has ample storage, a mirror, and offers very god privacy from the rest of the ship. 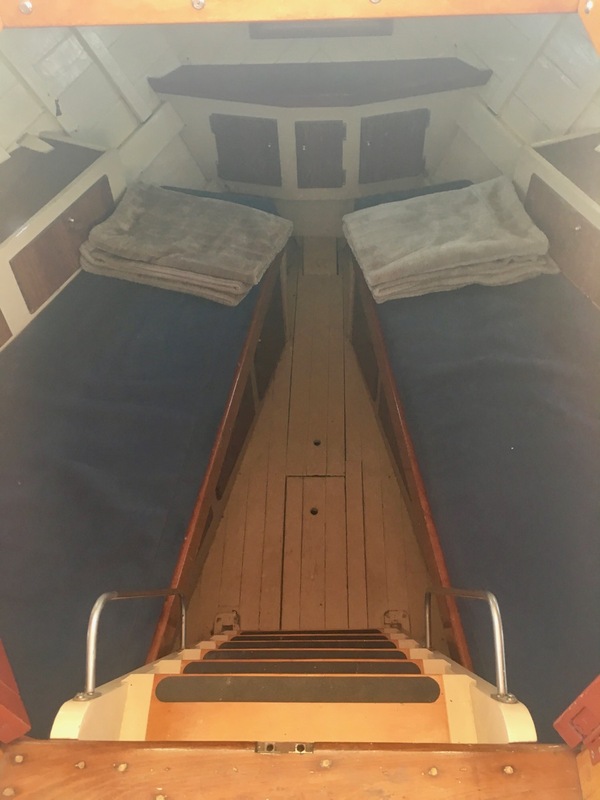 At this stage two single bunks are fitted, but this can easily be converted to a huge double berth with a minimum of carpentry work. 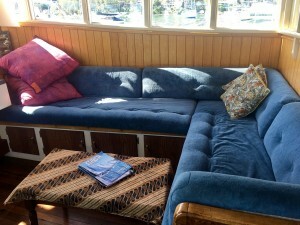 The center of the boat is occupied by a lovely sitting, relaxing area, with L shape settee and a coffee table. 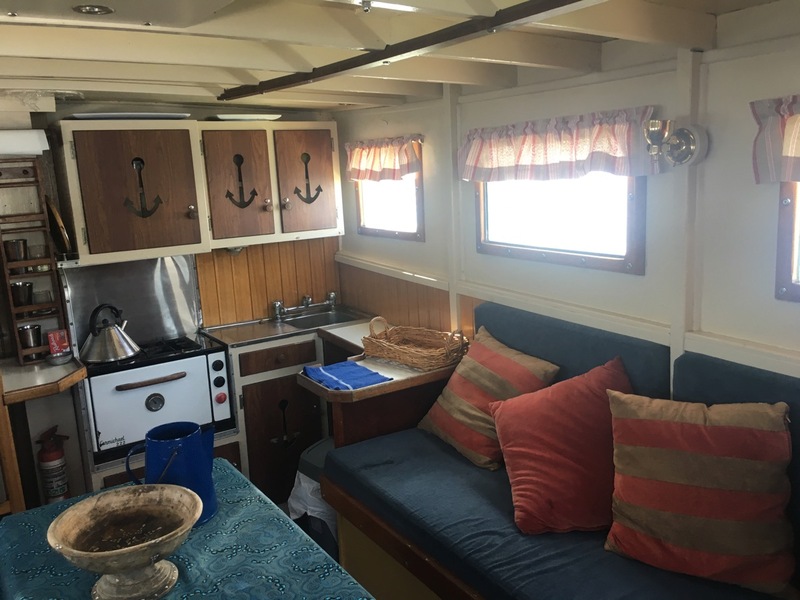 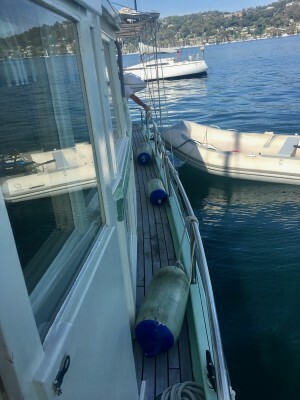 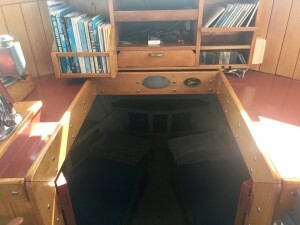 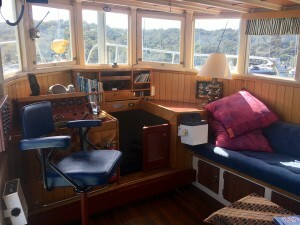 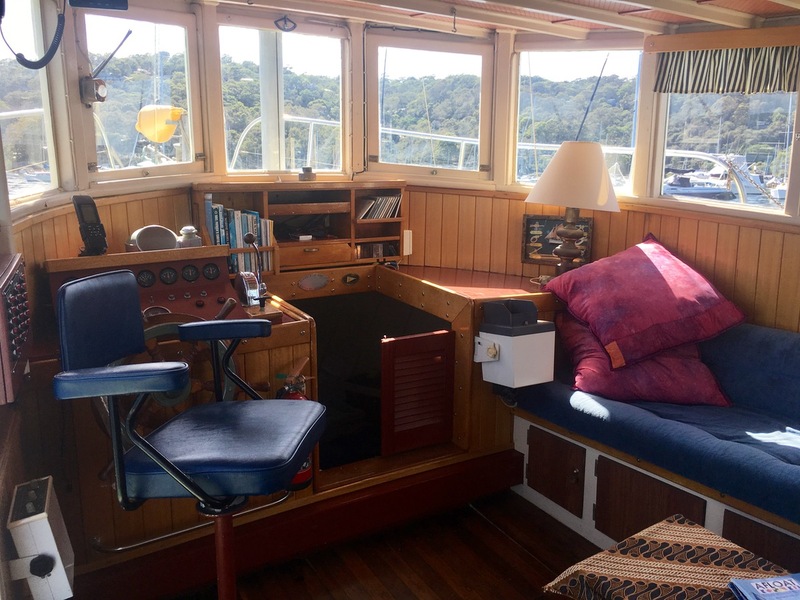 This lounge is next to the helm seat and controls, which allows the skipper to have company when under way, and when at anchor makes a perfect sun-room with all-around water view. 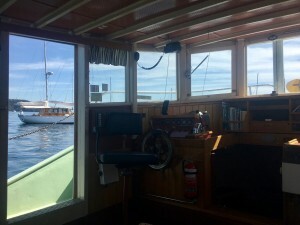 It is cool and bright in summer, but warm in water thanks to the all around glass windows catching the light. 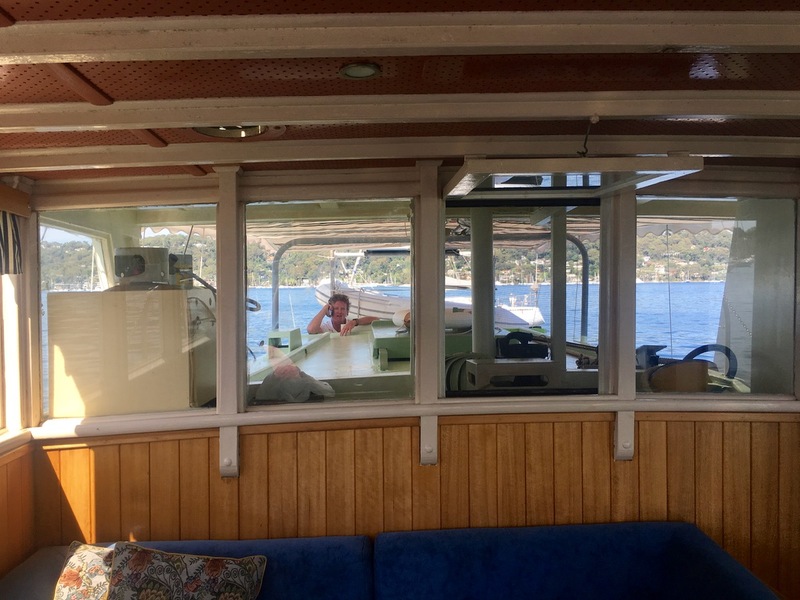 The sliding door provides excellent cross ventilation on hot days, while the area is also cosy and dry on stormy day, when one can enjoy watching the weather with a good book and a hot drink. 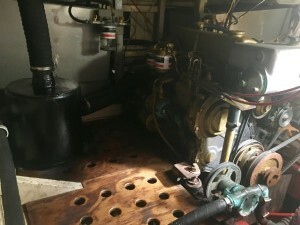 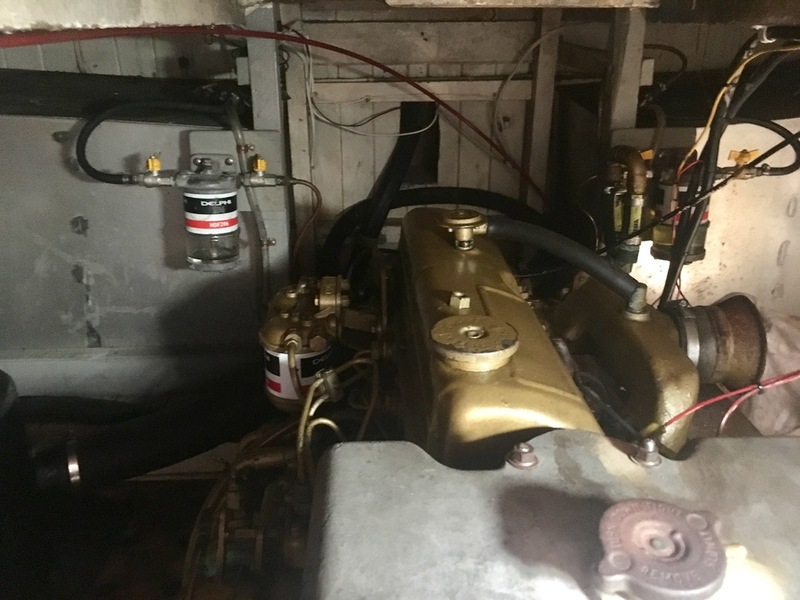 Below the polished floor is the entrance to the engine room, which is dry, free of smells, and wide enough to easily move around the mighty Ford Les engine when servicing or checking fluid levels. 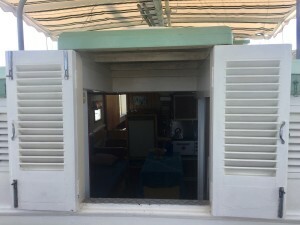 It is also designated to accommodate well stowed storage boxes for tools, spare parts, the tanks, ship systems etc. 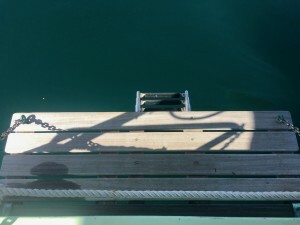 Lastly, the aft swim platform is strong and well attached to the transom. 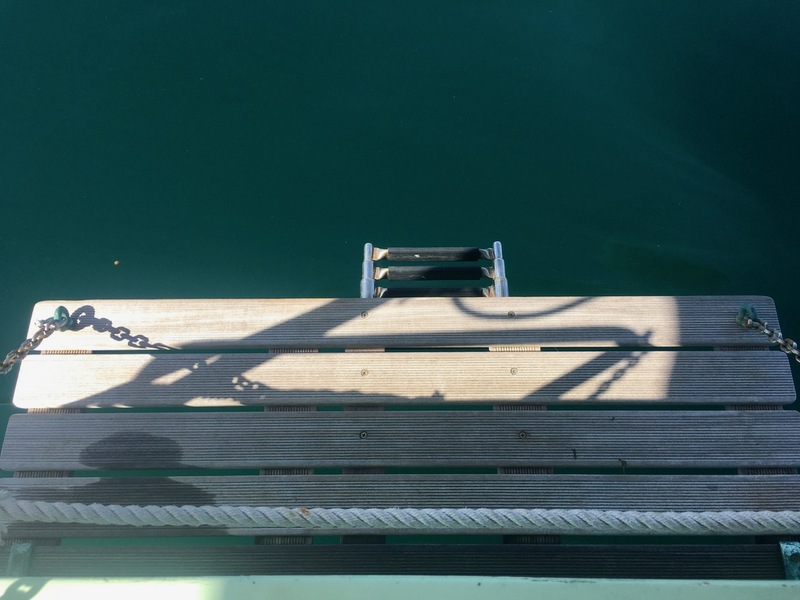 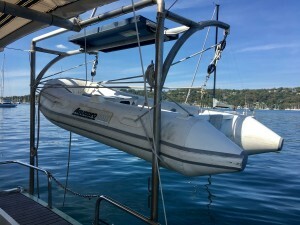 It can be lifted clear of the water and is fitted with a retractable swim ladder. 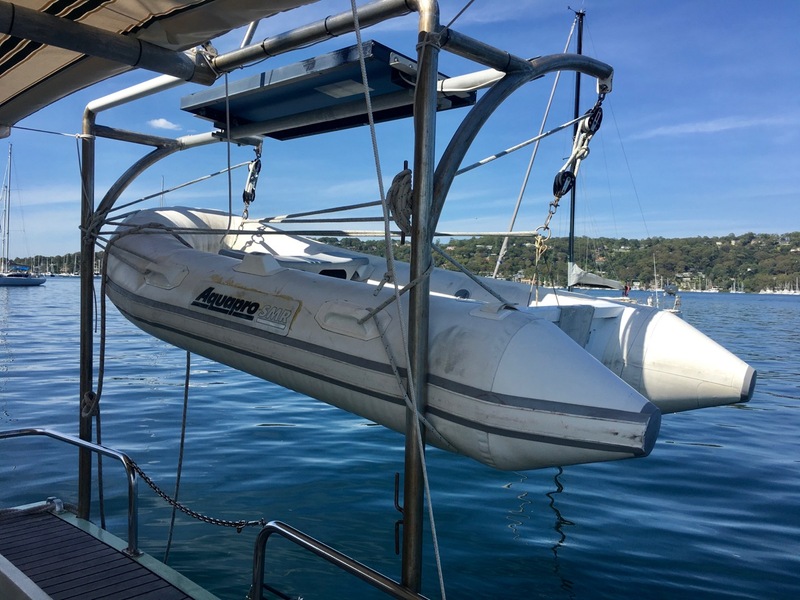 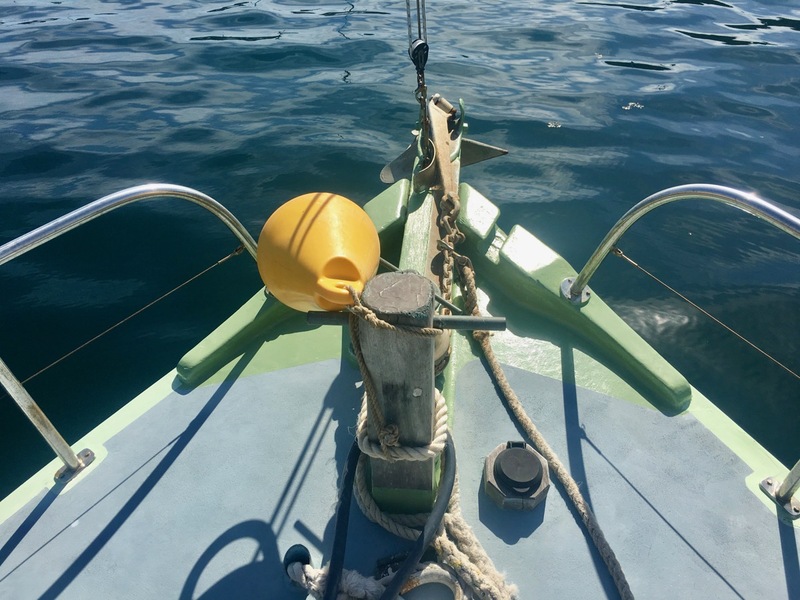 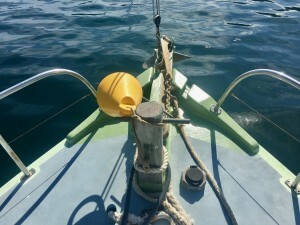 The over-engineered davits are immediately above this, making launching and retrieving the dinghy a breeze. 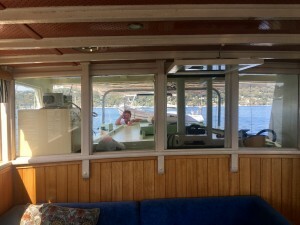 Overall, Joy Sea is a remarkable and sound vessel. 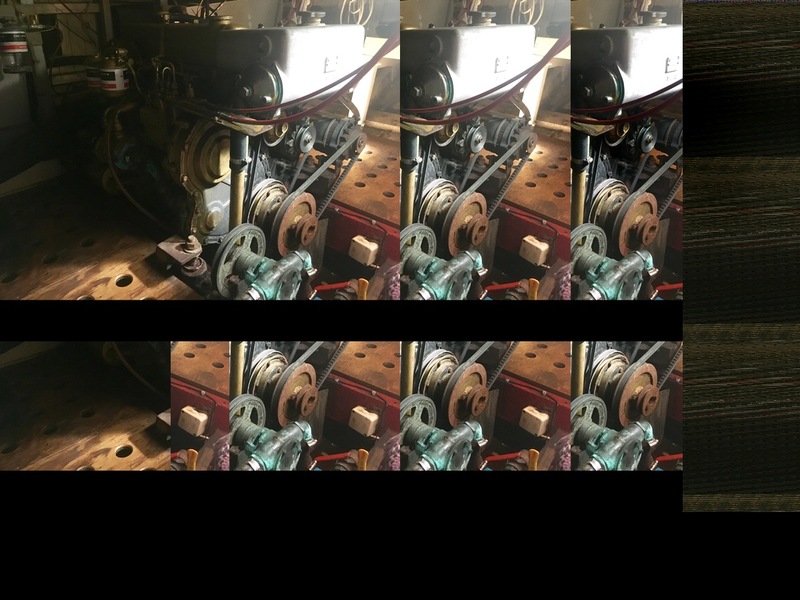 It will pass survey without a hitch, and has benefited of the constant love and knowledge of the owners and their numerous friends including marine surveyors, shipwrights, local mariners etc. 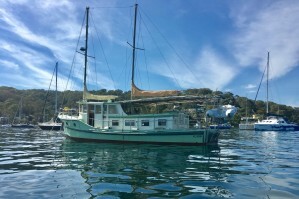 It will be sad to see her go after so many years of love and adventures, but the owners are philosophical. 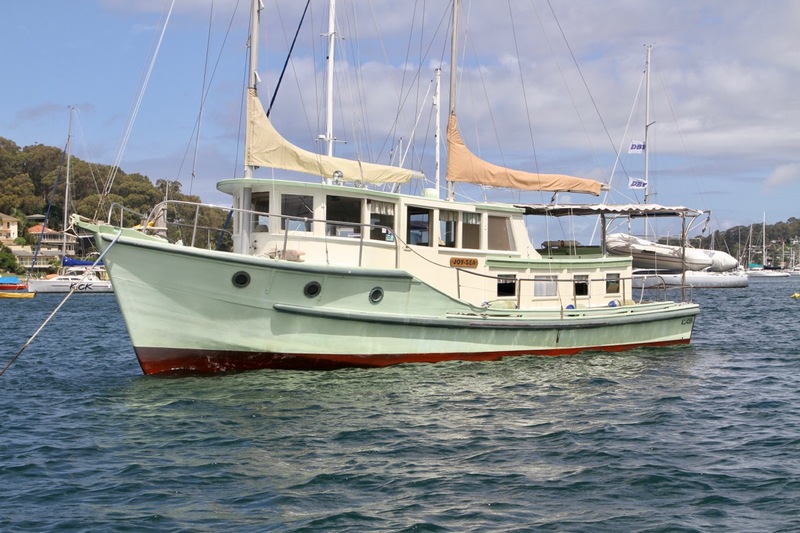 Someone else will fall in love with this charming little ship and start a new story with her. 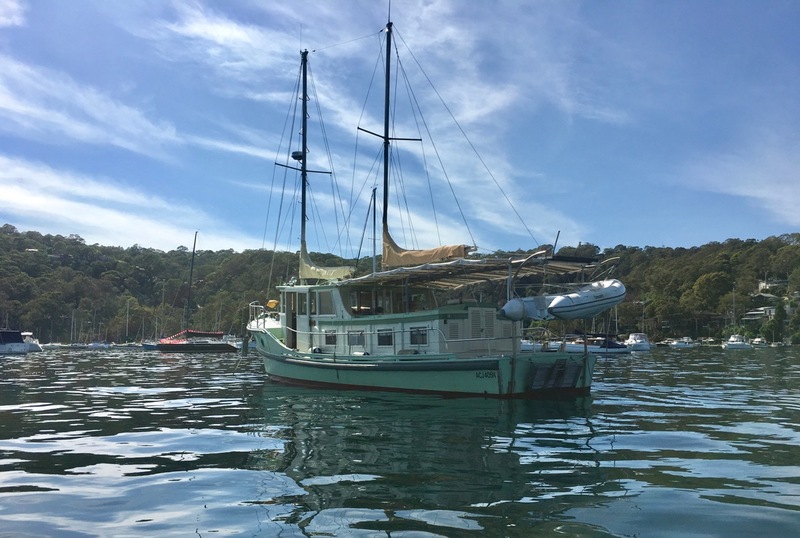 After seeing her around for almost 16 years, always a happy boat, and spending quite a lot of time on board with the owners, we feel privileged to be involved with finding her a new home, and can vouch that her lucky new owners will have many beautiful years ahead of them on board Joy Sea. Please contact our friendly team at Nautilus Yacht Management if you have any questions or wish to arrange for an inspection. 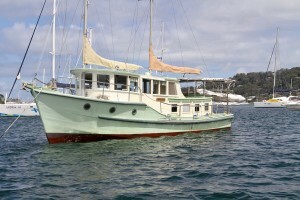 We will be delighted to show you around this lovely boat. I would like to enquire about JCT17 1950's converted trawler. Perfect live-aboard.